Building your own business is no joke -- it takes time, dedication and plenty of patience. When turning an idea into a profitable business, there is one aspect of the process that you should never ignore: Always staying true to your brand's core values and creating a visual identity that is consistent throughout all your marketing campaigns. Making sure your brand is recognizable in every instance -- be it website, social media or print -- will give your business credibility and a feeling of stability. Your followers and clients will feel like they know you, like they can be friends with your brand. Staying visually consistent is your best bet to growing exponentially and staying relevant. What do they spend their hard-earned money on? Taking these things into consideration will help you not only create the perfect brand but also maintain the values it is built on. Remember that your brand is a medley of you AND your customer. When your brand resonates with your customers, you are on the right track to success. When deciding on a logo and its variations, make sure that every instance is memorable yet not overly trendy. There are ways of grabbing the attention of your target generation without having to settle for that script font that will only be a fad for a year at most. Your logo and its variations need to last without change for a few years; after that, you can look into a rebrand to grow along with your customers. You will need a main logo to be used everywhere, including your invoices, and at most two variations for watermarks or when you want to go for a more subtle look. When it comes to deciding a color scheme for your brand, it is imperative to take into consideration the psychology of color. Each color has a different emotional value, thus giving the colors you pick great importance as to how your brand affects your clients emotionally. Color has been scientifically proven to significantly enhance memory performance and if you can tap into that, your brand will greatly benefit from it. Fonts and typography choices need not be overcomplicated. If your logo includes a novelty font, it does not need to be used all over your marketing materials as it may not only detract from your brand's message but also over saturate. Choose a font combination that will stand the test of time and outlast fads that come and go is key to staying on brand. 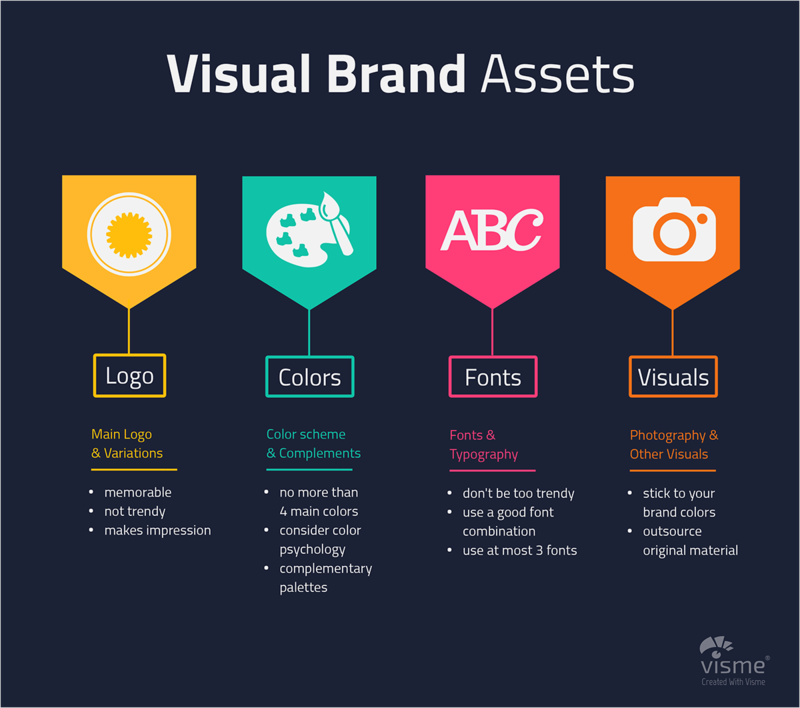 Your brand doesn’t just need a logo, a font scheme and a color palette, it also needs visuals! By visuals I mean: backgrounds, textures, icons, complementary elements and photography. Having a digital folder of all the kinds of visuals you need to use for your brand is a handy tool for when designing new graphics, brochures, websites pages, infographics, etc. Backgrounds and textures should follow the color palettes, as should icons and complementary elements. Photographs can be sourced to follow your color palette as well: search stock photo databases by color or hire professionals photographers to create your own images. You can also commission illustrators to create branded art if your brand fits that style. I mentioned earlier that you need a style guide to keep track of your brand and how your visual identity is portrayed. No matter if you are a one-man show or a team of 20, you will need a branding style guide at hand at all times. If you are a small company, a simple branding guide that you can print out and paste on your office wall will be enough, but if you are a larger company, then you need a detailed branding style guide in the form of a presentation or PDF file. 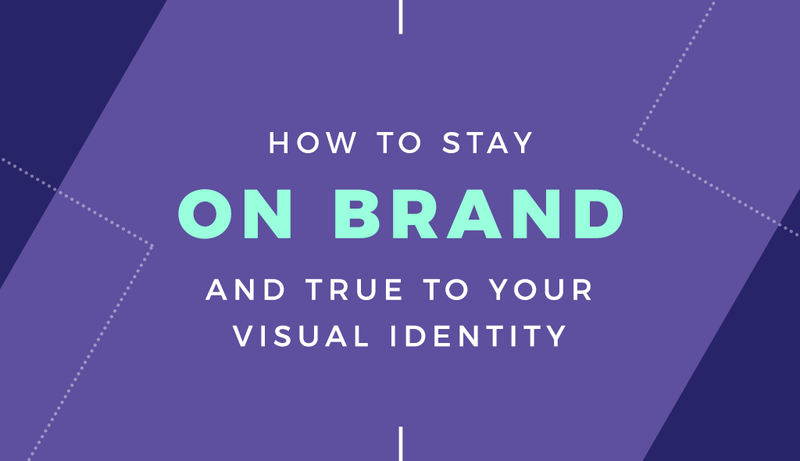 This way, every person involved with promoting your brand -- designers, marketing team, vendors -- will know how to stay true to your brand’s visual identity. Your branding style guide needs to include everything about your brand, from the mission statement to the textures and color numbers for digital AND print. When a new employee comes on board to join your company, the first thing they should see is your branding style guide. What problem does your brand solve for your clients? How do you want your clients to perceive your brand? What about your brand makes your clients happy? All the logo variations, making sure the main logo is the most prominent and each variation includes an explanation as to where and how it should be used. Make sure that these are available in all sizes, with transparent background in an online downloadable folder. The color palettes: the main one first and then the complementary and additional palettes in descending order. Be specific: Include color hex numbers for digital purposes and pantone numbers for print. Font and typography choices need to include font names and links to download them. Include a visual representation of which font should be used for headers and which font for body. Also, give a list of suggested sizes and weights. Create a photography and visuals database in any online storage program like Google Drive or Dropbox. Upload all files, including your logos, organized with relevant titles as to what they are to be used for. For example: logos, photography, backgrounds, textures, icons, decorative elements and shapes. Include an index in your guide and a link to the database. The third part of your branding style guide will need to be a good practices guideline, showcasing “how” and “how not to” use the logos and other aspects of your brand. Include your preferred sizes for social media graphics and a visual template of where each element should be placed. If all your graphics have the logo centered on the left hand side, create a rule about it, that way no one will create a graphic with the logo located on the top right corner in a different size. What is the minimum size of your logo? What is the minimum size font that can be used in main copy? What are ALL the graphic sizes for all instances, digital and print? Include side-by-side examples of how things should look and how they shouldn’t. There is no better way to explain this than by showing it. At the end of your branding guide, include contact numbers and emails of the person in charge of your marketing, just in case the person following the guide has additional questions. For example, a freelance graphic designer may need to create a new event poster and the suggested size is not included in the guide. If you are a one-person show or your business is still quite small, you might not have the funds (yet) to hire a branding strategist or graphic designer to create your brand’s visual identity and the branding style guide. Not to worry -- there are quite a few online resources that can help. That said, investing is a way of showing the world that you believe in your business, so I don’t suggest you go the completely-free-and-DIY route, unless you yourself have some design chops. You can create your logo yourself with a vector program or use an artificial-intelligence application like logojoy, or logomakr. If you stick to the free options, your logo will be nice but it won’t look overly professional, so make sure you take into consideration all the information above on building a memorable brand. Both these applications also have paid options which will give you better and more professional results. Believe it or not, you can build a brand with applications just like the ones I mentioned above, and they will provide a branding style guide to help you stay on brand. My favorite applications for this are Tailorbrands and Builtbyemblem. Sourcing photography that fits your brand is also not too complicated. To get some inspiration, you can use kaboompics and search their database by color. Bonus Tip: If you have been using Instagram for a while and want to know how “on brand” your feed is, use colorkuler to check! If your business is a bit larger and you collaborate with employees in different cities or even countries, you should look into a team organization tool for visual content creation. I recommend Visme for Teams. With the growth of online design and DIY graphics programs, there are better ways to control how your graphics are designed and how to stay on brand. The Visme for Teams tool dissipates all confusion as to how the graphics and marketing material can be created and organized when working with various team members. There are options to keep all files organized by topic or by project. Privacy can be toggled in projects until it is ready to be shared. Visme for Teams also offers analytics on the performance of the graphics created in the program, helping your visual identity grow in the right direction. Staying on Brand with Pinterest is really important! There are so many pins in the feed that it gets overwhelming when yours are lost in the mix. I’m planning on starting a new blog in the next month and I’ll definitely be referring back to this when I do! Thanks for the feedback, Nicola. We’re planning a few posts on logos — I hope you’ll find them useful! Most importantly, have fun building your new blog! Make sure to bookmark or pin the article so you won’t lose it. BOOKMARKING THIS! What a helpful article! Reading it has made me realize that I have sooooo much work to do when it comes to branding. I’m totally guilty of being on bored with that trendy script font that’s totally going to go out of style. I definitely have a lot of thinking to do! Thanks, Carolyn! Stay tuned for another series of posts we’re doing on logos. Hope you’ll find it useful. All those trendy script fonts are great for graphics that will be used a few times and that’s it. When using a script font in branding it has to be timeless. Have fun created your styling guide! As a new blogger, I found this very helpful. I pinned for later reference! This is an excellent article! The infographics are awesome and all of this is so important for any brand to keep in mind! 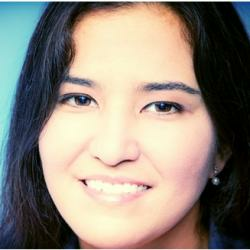 Hi Kacey, I love the infographics too! They are so cool and pinnable! Hope to see you around here again. Wow, so many things that I didn’t think of when I came up with my brand identity! I do have to say that it worked out anyway, because I am happy with it! Thanks for the feedback, Willow. You can always go back and revisit your visual style guide to incorporate some of the guidelines here for future use by other employees or collaborators. I loved building my own brand too! Nice post. One question – Are all your infographics on the blog created using Visme? Thanks for the feedback, Madhav. Yes, all infographics were made using our own tool, Visme. Very cool. It’d be nice if you can create some walkthrough videos of how you created these infographics. Are these templates available on Visme Standard accounts? Madhav, Visme has a YouTube channel! There is a link bar at the top of the page. Thanks, Madhav. These templates will soon be added to Visme so you can also use and edit them. Please stay tuned when we roll them out and we’ll also include a walkthrough video of how to use them. Yea, every single one. Cool huh? I loved reading this post, I agree about the trendy fonts. Right now, it seems everyone is using “Brusher” for all their Pins, logos, etc. I’m exhausted even looking at it because I’ve seen it so often now. I try to avoid it at all costs now. Brusher is pretty sold out I agree! I made a graphic once about how tired I was of seeing that font everywhere. Thanks for the suggestion, Alex. Hi Orana, thanks for the great article, super helpful for anyone getting started with a new brand. What I liked about Tailor Brands is that you can design your logo the same way you would at Logojoy but then they take you to their branding suite where you have tons of tools that save you time with everything brand related. Thanks for the suggestion, Ezra. Never heard of Tailor Brands before but did a quick search and it also seems like a helpful tool to add to this list. Thanks for the list. It’s been very useful to me and my friends who are going to start their businesses. I’m glad it helped Simon! I’ll be follow your tips regarding branding or designing because i’ve never ever found this type of post on this platfrom blog.visme much impressive. Thanks so much for your comment! We hope you come back for more tips like these. Orana, 100% agree with you. Awesome post! Logos create familiarity and promote brand loyalty. Without the logo, your products become commodities, and any company could produce them. When people get to know and love your logo, they’ll see your logo as a badge of honor or stamp of approval and know that the product will exceed their expectations. The second reason that a unique logo is important is that it helps attract new customers. People are naturally drawn to design elements, and depending on your audience, your logo can draw them in. Small businesses had to shell out hundreds for a graphic designer to create a professional logo they could feel proud of. Now, this isn’t the case anymore! In fact, there are tons of free logo makers available online that can churn out surprisingly great results. Of course, they are perfect, but that’s a good start. Thanks so much for your wonderful comment! I agree with you, logos are like the brand’s most important personality trait. I’ve recently come across a logo maker called DesignEvo that really packs a punch when it comes to designing custom logos. You can even download them as .svg for added customization. Thank you for amazing tips, such an excellent article! very helpful things. Nice post. Your post is very informative. I learned a lot. Thanks for sharing this useful post about brand identity.